Flow cytometry continually amazes scientists with its ever-expanding utility. Advances in flow cytometry have opened new directions in theoretical science, clinical diagnosis, and medical practice. The new edition of Flow Cytometry: First Principles provides a thorough update of this now classic text, reflecting innovations in the field while outlining the fundamental elements of instrumentation, sample preparation, and data analysis. 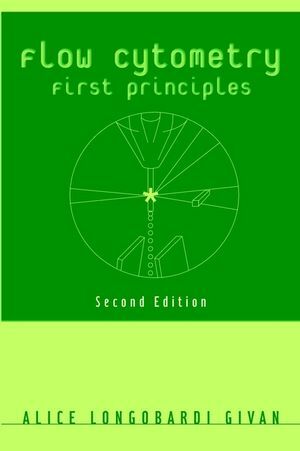 Flow Cytometry: First Principles, Second Edition provides scientists, clinicians, technologists, and students with the knowledge necessary for beginning the practice of flow cytometry and for understanding related literature. Alice Givan was born in Brooklyn, N.Y.. She received her A.B. at Bryn Mawr College and her Ph.D. at Harvard University. After completing her formal education, she moved to the north of England where, at Newcastle University Medical School, she learned flow cytometry with an instrument that was being used for the development of methods to predict and monitor rejection reactions in transplant patients. After 20 years in England, Alice Givan moved back to the United States and is now Director of the Herbert C. Englert Cell Analysis Laboratory (the flow cytometry and fluorescence imaging resource of the Norris Cotton Cancer Center) at Dartmouth Medical School. She also organizes and teaches courses and workshops for new flow cytometrists. Instrumentation: Into the Black Box. Seeing the Light: Lasers, Fluorochromes, and Filters. Cells from Without: Leukocytes, Surface Proteins, and the Strategy of Gating. Cells from Within: Intracellular Proteins. Cells from Within: DNA in Life and Death. Disease and Diagnosis: The Clinical Laboratory. Out of the Mainstream: Research Frontiers.